This is a truly beautiful book. 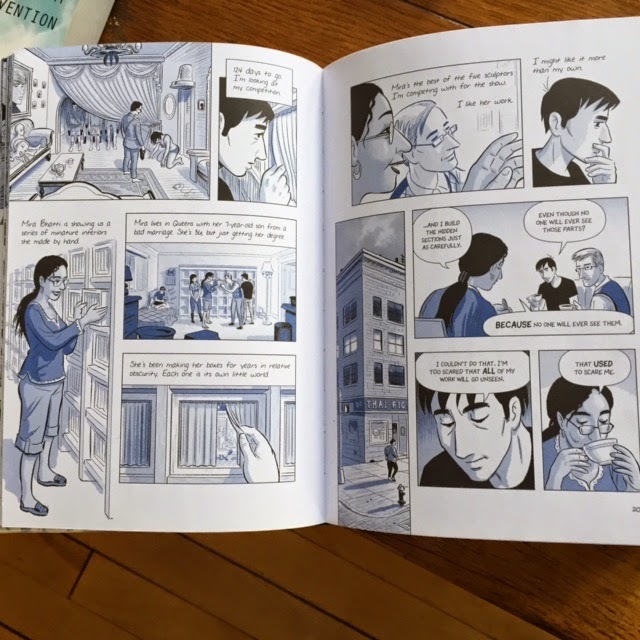 I was familiar with Scott McCloud from his books Understanding Comics, Reinventing Comics, and Making Comics and immediately sought out his new book, The Sculptor, at the library when I saw an ad for it in the NY Times Book Review. All I knew about it when it started that it was about a sculptor and Neil Gaiman said it was "The best graphic novel I've read in years." I'm going to be very brief in my description as I loved the way book swept me up and surprised me and hope it can do the same for you. What initially attracted me was the theme of an artist's work and the question: how important is it to you to have your work seen and what price will you pay for it? It is also a story of youth (one's twenties are now one's youth for me), love and loss. I've read it twice and will probably read it one more time before I return it. The first time I was pulled along by the force of the story; the second time I savored the details and the images. Although I wrote in Art Lessons, "If we love the work for itself more than for the result, we will find a way," I've done my fair share of struggling with the issues of getting my work out into the world. I can't say that The Sculptor gave me answers but some part of me felt changed by the experience of reading it. I try to approach my work with the most open spirit that I can. When I am alone working in the studio, I feel free. When I am dealing with the various aspects of getting my work out into the world or drift to thinking about opportunities I wish I had, I sometimes feel a knot of hardness in my heart. Thanks to Scott McCloud, it is now a little smaller. Mo My kids introduced me to graphic novels. I don't read that many and I sometimes find them difficult to read and hard to follow. I have read some great ones. I loved this one and Roz Chast's Can't We Talk About Somehting More PLeasant? is amazing. Also high on my list Persepolis and Alison Bechtel's Fun Home. am listening and I will try to read it but I am not that excited by his drawings!